It’s hard to deny that the Marvel’s Cinematic Universe has affected their comics. Characters generated on film have leapt into the pages of comics, and niche heroes are now comics megastars thanks to movie successes. But the movies’ impact on the comics stretches actually back farther than you’d think. Before Wesley Snipes inhabited the role of a superpowered vampire hunter, Blade’s powerset was radically different. Highly trained in martial arts and weaponry, Eric Brooks’ origins saw him inherit the long life and ability to detect supernatural creatures that came with vampirism (even an immunity to vampire bites). But when Blade reimagined the character as a “Daywalker”, a legendary human/vampire hybrid with all the superhuman abilities of a vampire and none of the weaknesses, the comic character shortly followed suit following the movie’s success. In a 1999 story arc in Peter Parker, Spider-Man, Blade not only picks up a decidedly movie-inspired outfit, but is also bitten by the vampire Morbius and granted the superpowers he exhibited in the movie — and even the “Daywalker” title. Eager to capitalize on the movie’s success, Marvel tasked Grant Morrison and Frank Quietly to reimagine the X-Men’s look as part of their run on the series. In The New X-Men #114, released in 2001, they did just that. Although the yellow X’s on their chests kept some color, the X-Men debuted new, dark leather uniforms that they would wear until Joss Whedon and John Cassaday’s Astonishing X-Men returned them to spandex. The X-Men were not the only characters to get a movie-influenced costume change. Although his movie costume was inspired by the Marvel Ultimate Universe’s interpretation of the character, following Hawkeye’s first proper appearance in 2012’s The Avengers, the main comic’s Hawkeye ditched his long-used purple mask and replaced it with a modern, sunglasses-toting look for Matt Fraction and David Aja’s Hawkeye the same year. But perhaps the most egregious and obvious instance would be Star-Lord. 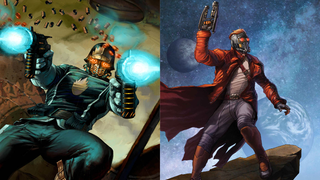 Following the release of Guardians of the Galaxy last year, ditched his comic book look whole hog and started using the movie’s leather duster, mask and element guns full time in his standalone series Legendary Star-Lord. Perhaps the first major influence Marvel movies had on the comics would come with the huge success of Sam Raimi’s Spider-Man in 2002. Since the character first appeared in Amazing Fantasy #15, Peter Parker had always used mechanical webshooters as his primary tool, a creation of his own technological genius. But Tobey Maguire’s Parker developed the ability to shoot webs organically in his movie origin, a radical departure from the comics — and the comics quickly followed suit. In The Spectacular Spider-Man: Disassembled, released in 2004, Peter underwent a physical transformation that granted him more natural spider abilities, including subdermal spinnerets that allowed him to create and shoot biological webbing. Spider-Man ditched his trusty mechanical webshooters and relied on the biological webbing for the next four years. In Brand New Day, which began a year after Spider-Man 3 released, Peter was inexplicably back to using mechanical webshooters, his natural webslinging abilities never mentioned again. To many, Samuel L. Jackson is Nick Fury. But the long saga of the actor’s impact on the Nick Fury of the comics begins well before the introduction of Nick Fury Jr. When Nick Fury was introduced in the “Ultimate” universe in 2001, he was already drastically different to his main universe counterpart — cropped hair, clean shave, and of course, African-American. But suddenly a year later in The Ultimates, Fury was redesigned to be completely bald and bearing more than a passing similarity to Samuel L. Jackson (the comics even remarked on the likeness). Jackson got wind of the use of his likeness and contacted Marvel — instead of forcing them to change the character’s appearance, he merely instead asked that any future movie appearances by the character would be played by him. Perhaps one of the earliest impacts of the current MCU on the comics was the reintroduction of Pepper Potts as an important member of the Iron Man supporting cast. Before the first Iron Man movie, Pepper had long been out of Tony’s life, and was even married to “Happy” Hogan for an extended period of time before the character’s death during Civil War. But with Paltrow’s Potts a key part of the cinematic Tony Stark’s life, Pepper was re-integrated into a more prominent role in the Iron Man comics as Tony’s personal assistant, just as she was in the movies. Shortly after she was injured in a terrorist attack, and was given an arc rector similar in design to the movies (at that point in the comics, Tony was not using an arc reactor but an artificial heart) to keep her alive. Pepper even eventually becomes the CEO of Stark Industries, just as she did in the films, and was given her own suit of Iron Man armor to become the hero Rescue — a development referenced in Iron Man 3 when she briefly dons an armor suit. Just as Battle Scars had introduced an MCU-inspired Nick Fury to the comics, it also added another cinematic creation to comics canon: Phil Coulson. The Guardians Of The Galaxy. Who? Perhaps the most notable impact of the Marvel Cinematic Universe on Marvel Comics in recent memory is the sudden prominence of Star-Lord, Gamora, Drax, Rocket and Groot, who make up the movie cast of Guardians of the Galaxy. Before 2014, the Guardians were some of the most obscure heroes in Marvel Comics. Even with Dan Abnett and Andy Lanning’s recreation of the team in 2008 (which inspired the makeup of the movie team, rather than the original 1969 roster), the group did not play a major role in the comics. But immediately following the huge success of the movie, the Guardians appeared everywhere. Outside of their own ongoing series, Rocket and Star-Lord (along with his aforementioned wardrobe update) got standalone comics series devoted to themselves, and will be joined by Gamora, Drax and Groot in that regard this year. They even got their own series of crossover comics in Guardians Team-Up. Suddenly the characters went from minor snippets to comic book headliners, all thanks to the success of the movie. Although less obvious than the above changes, some Marvel comics fans subscribe to the belief that the output of the Comics themselves is now more strongly tied to the growth of the MCU — and the presence of Marvel moviemaking rivals in the form of Fox and Sony. Marvel themselves have admitted the movies do influence their publishing schedule, with characters due to hit the silver screen now getting their own standalone comics series introduced ahead of the movie debut to capitalize on moviegoers desperate to know more — the Guardians, as mentioned, received that boost, and this year saw the debut of a new Scott Lang starring Ant-Man series as a prelude to his July movie. But allegedly the same is inverted for when movies not made by Marvel are on the horizon. Many fans look to the cancellation of the Fantastic Four’s ongoing comic series this year, timed just as marketing for the Fantastic Four reboot is winding up. There’s even been rampant speculation that the ongoing Secret Wars event, which partially reboots the Marvel comics universe, could lead to the X-Men being sequestered in their own side-universe. Marvel have flatly denied the rumor, which would allegedly take the focus away from the X-Men in the main comics in an attempt to remove focus that could aid Fox’s X-Men franchise as it continues to expand with X-Men Apocalypse, Deadpool and The New Mutants. But not only is the idea of Marvel hobbling the comics universe to spite their “rivals” is speculation at best, it also doesn’t make sense considering their preservation of their most popular (and most financially viable) hero, Spider-Man in comparison. Although he’s soon to join the Marvel Cinematic Universe, years of movies from Sony have done little to impact Marvel’s Spider-Man comics negatively. Finally though we come right up to the present day — literally to this week, with the latest controversy about the movie universe affecting the comics. This week’s Uncanny Avengers #4 reveals that longtime mutant heroes Scarlet Witch and Quicksilver were never actually mutants — a move that brings them in line with the non-mutant origins of the characters as they appeared in Avengers: Age of Ultron. Some fans have likewise interpreted this as a harmful change intended to spite Fox’s own interpretations of the characters (particularly Quicksilver) as mutants in their movies, although the former idea of tying into Age of Ultron that perhaps holds the most merit. Just as Blade was changed to better reflect the movies, 16 years later we’re seeing the same thing. It probably won’t be the last time a character’s origins are meddled with to better suit the movies. As hard to deny the impact as it is, in the end perhaps the more “sinister” elements of the MCU’s influence in the comics — the idea that Marvel are potentially spiting their moviemaking rivals at Fox and Sony by undermining the characters they have the film rights to in the comics — seem to be little more than speculation, combined with Marvel’s own re-jiggering of its comics output to act as ancillary support to its global blockbusters. The comics will always be different from the movies (over 80 years of stories too insane for film can attest to that), but as a bigger and bigger audience gets used to big screen superheroics, it makes sense that the comics would be open to a little more integration.